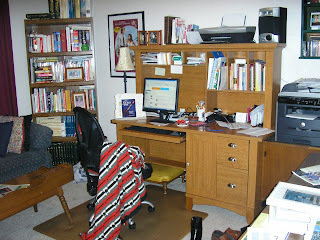 The Un-Official Blog of Romance Author Maddie James: Decorating or Procrastinating? Last night I sat down to write, took a good look around me, and said, "This place needs an overhaul." As you may know from recent posts, I did an overhaul a few weeks ago on my office closet. That task now needs to carry over to the rest of the room. It must be a trend, actually. At my day job, I'm moving my office to a slightly bigger one. So, I've spent some time this week cleaning and purging and giving away items and even brought quite a few personal items home--like books, a mirror, my tennies that I never use there, the handweights in the corner (same story), an extra lamp, etc... Even though I'm moving into a bigger office, there are leftover items from the previous tenant (which I will need in my job) that need to stay. So, time to purge. Yeah. That's why I deduced it was overhaul time. The room needs a good cleaning and the stuff organizing and the walls painting. But tackle one task at a time, I will. Let's clean, first, organize next, and then paint. Or vice versa. We'll see. I decided to move the couch OUT so I could clean around it and pull some other furniture away from the walls to clean, etc. Moving the couch OUT of the room was more of a struggle than I remembered when it when IN the room. But I managed and set it in the entry hallway. Now, I have a pretty good sized entryway. It's long and wide and fairly empty. This is where the plan changed. My brain started spinning and all I could think of at that point was "nook." 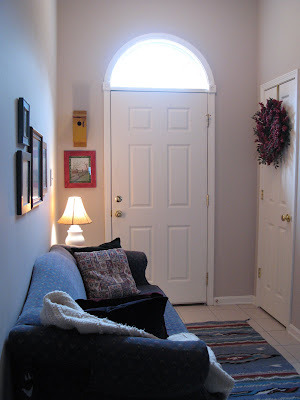 Could I make a nice little nook in my entry way? A place where this couch and possible other decorative touches could hangout while I'm cleaning and organizing and painting the office? Could, perhaps, this become a nice little nook that I might like to keep for a while? I dug out some old pictures from the garage. I even painted one of the frames. I spied the birdhouse my son made in Boy Scouts years ago and snatched that. I borrowed a small table from the office and pilfered a lamp from my bedroom. I moved my grandmother's Plaster-of-Paris, cat-in-a-basket to the corner. 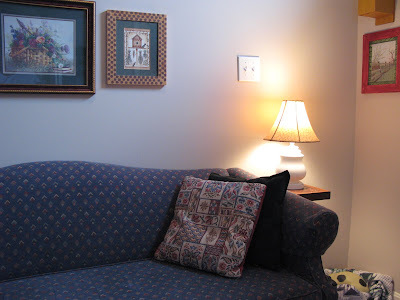 I tossed the pillows and fluffed an afghan and hung the pictures on the wall. I have a nook. Look! A nook! Can you look and see my nook? I'm thinking I should put a book in my nook before you look. Did you like to look at my nook? Oh. Yeah. Writing. Deadline. Gotcha. But the nook is great, right? Right? The nook is a winner! What a great idea. And now that you have control over your house, you are ready to write. Oooooh! I have an itty bitty Christmas tree... Nice idea! Love your nook! And great idea Magdalena! Thanks, Taryn! How is Nano going for you? I need to stop by and see your progress. Well, as you saw on my blog- it's coming along. I'm less than 10K from the NaNo goal, though I still have a little ways to go to finish.